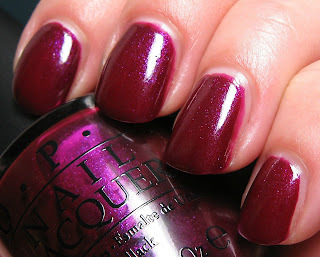 The OPI Miss Universe Limited Edition Collection contains four shades with a variety of colors and finishes. They are scheduled for an August release, set to tie in with the Miss Universe contest to be held in September, although they are starting to show up stores now. 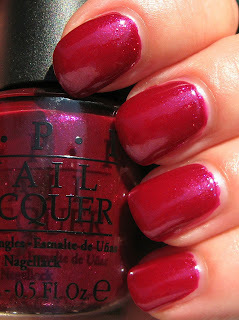 The application and formula on all of the shades was nice and easy, and my photos are shown using two coats. 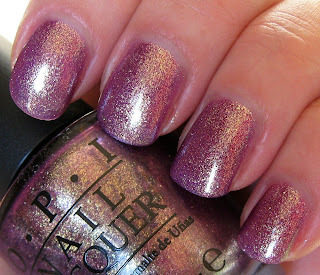 It's My Year is a medium plum shimmer packed with gold micro glitter, giving it a somewhat foil finish. The first photo was taken in full sun, while the second photo was taken in the shade. In brighter lighting, you'll see massive amounts of sparkle, while lower lighting really refines the gold glitter. Congeniality is My Middle Name is a bit of a chameleon--in brighter lighting (full sun directly below) it's a berry colored shimmer with pink and purple shimmer, that also seems to reflect some blue shimmer. This is a jelly finish with shimmer, if there is such a thing. Normally, jellies are found in creme finishes, but take a look at the second photo. Indoors, the color is more of a burgundy, and the jelly aspect is evident. Presto! Now it's a vampy jelly! Swimsuit...Nailed It isn't terribly unique, because we've seen a number of similar shades recently, but it's still a great bright royal blue with a top-notch formula. This shade seems to have a charcoal base, making it nearly opaque in one coat, although I did use two in this photo. It has blue foil micro glitter, giving it a metallic finish in brighter lighting, and a more foil finish in lower lighting. 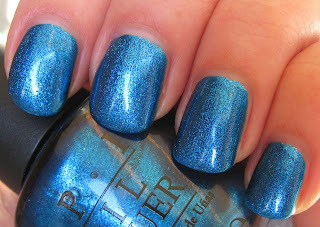 Crown Me Already is one crazy-busy glitter! 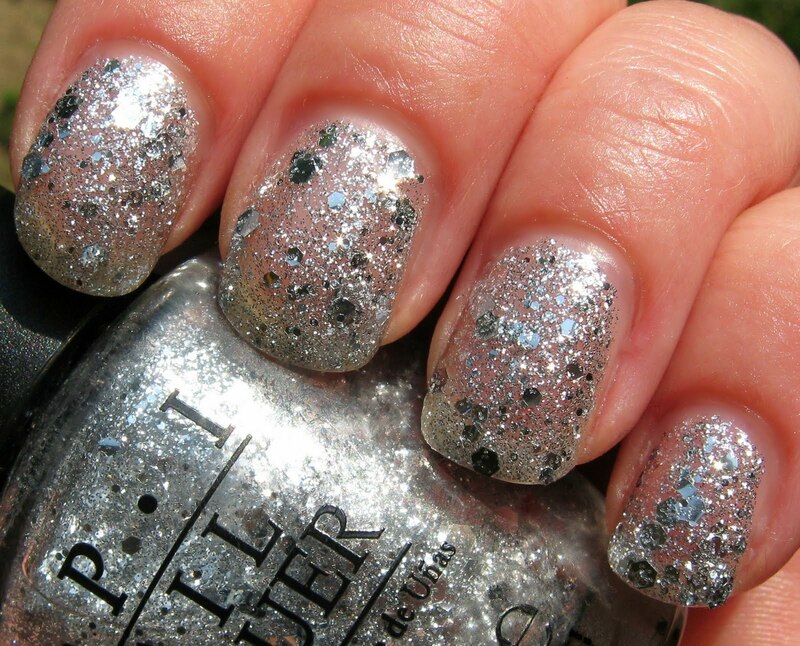 This bright silver shade is a maze of large hex glitter and smaller standard glitter in a clear base. This is almost too glittery for me, if that's possible. I thought this would be primarily a layering polish, but I did try it over Congeniality is My Middle Name, and it covered the color after one coat almost to the point where I couldn't see the base color. I'll have to play around with it some more with a lighter touch. This is shown using two coats, and a third would likely cover visible nail lines. The application isn't bad, but there is so much glitter in this shade, that it tends to need smoothing out here and there to break up the glitter colonies! What are your thoughts on this collection? I'm happy with all of them, but I adore Congeniality is My Middle Name. The jelly trait in that one definitely appeals to me. The only one I felt I need was It's My Year. Got it and LOVE it! What a transformer Crown Me Already is! I am going to get that one for sure. It's My Year kind of reminds me of Rally Pretty Pink, even though it's darker. I'll definitely have to get Crown Me Already! This is a pretty collection. Nothing really different here. Congeniality is My Middle Name, a beautiful reddish jelly! Can't go wrong with red jellies! ^___^ I simplu love it! I love this collection! I can't wait for stores near me to bring more in! Great swatches. I have all but the blue in this collection. Did not need another blue like this. But these are I think the first good swatches I have seen on this collection out there. I am not too sure I am in LOVE with Congeniality. I wanted to like it a lot more than I do. Maybe it will come to me in time. It boggles my mind why the release is so late when Miss Universe is already over. LOL! But I love them all pretty much. Some, I probably have something close to it already but I want to see them in person still. Now having had these for a time - still not loving this collection at all. The It's My Time is too much like Faye from Zoya and also a tish like OPI Rally Pink with that same theme in shades and the duochrome going on - it's not unique enough for what is out there already. And Miss Cong. is got way too much red in it for me to be a good red or a good purple. I look like I have ruddy hands with it on. I am swapping all the ones I have. OPI did a much better job of this same glitter topper in the Wimbledon collection. That one works - this one does not at all - as you say in your review - this one has too much going on. The next one they came out with in the almost same time released collection of the Wimbledon Grand Slam works way better and also has these same hex shaped glitters but in a better - smoother base.